At 9:50 a.m. today, the Spring Hill Police Department responded to a robbery that had just taken place at First Farmers and Merchants Bank, at 5398 Main Street. 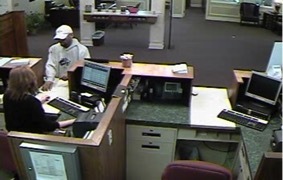 A medium complexion black male in his 20s, with a goatee beard, wearing a white baseball cap, light-colored grey hoodie sweatshirt, and light-colored jeans, approached a bank teller with a note asking for money. The male subject did not display a weapon, but acted as if he had one pointed at the teller from his sweatshirt. The subject left the bank with an undisclosed amount of money. The subject exited the west side of the bank, and no further direction was given. No bank employees or customers were harmed during the robbery. Spring Hill Elementary School and other businesses were put on lockdown as a precautionary measure. It is unknown at this time when the bank will re-open. The Spring Hill Police Department is requesting assistance from anyone who may have information pertaining to the identification of the person who robbed the bank. Please contact the Spring Hill Police Department at 931-486-3269.